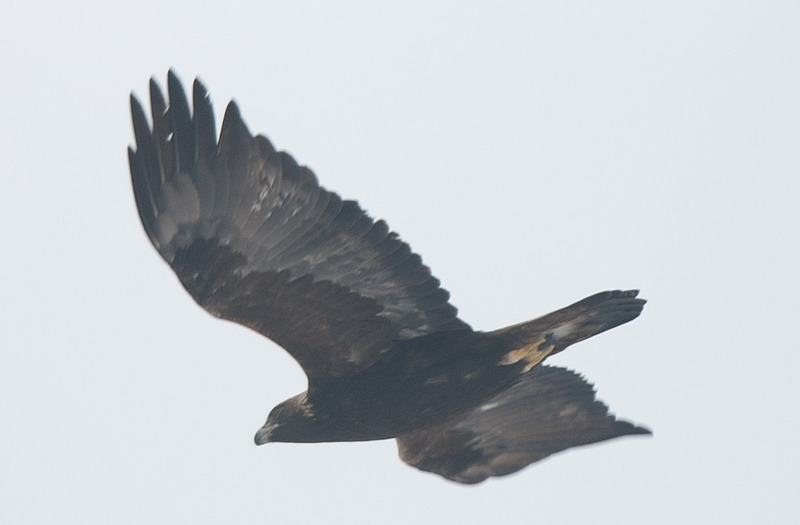 Golden Eagles (Aquila chrysaetos) have been extirpated as a nesting species in the eastern lower 48, but breed in the eastern Canadian provinces, as well as in the western states. I have seen this species gliding low over lime groves in California. But in the east, migration is the best time to observe them. First we have a few fresh-plumaged juveniles. 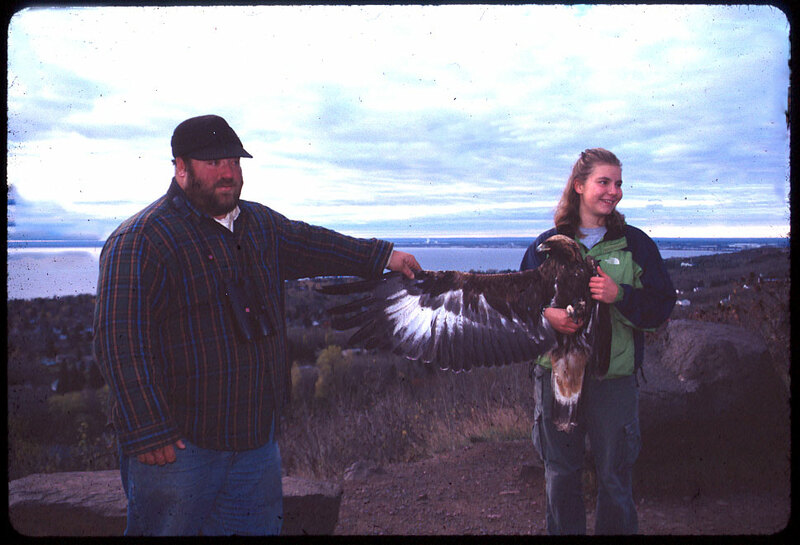 Here’s one at a banding station in Duluth MN. The guy is a former student of mine, and the young woman is his banding intern. I took him hawk banding when he was fifteen in the early 80s. The bander on Fire Island NY was Carl Safina, since then a MacArthur Genius and author of the recent Beyond Words: What Animals Think and Feel (2015). This young bird, hatched the previous summer, was captured at sunset in early November, measured and banded, but held overnight and released following this photo op at sunrise. Goldens have golden head-neck feathers, hackles, at all ages. There’s a classic area of white at the base of the flight feathers and all the tail feathers are white at the base. This is Fall 2001, and a scan of a 35mm slide. 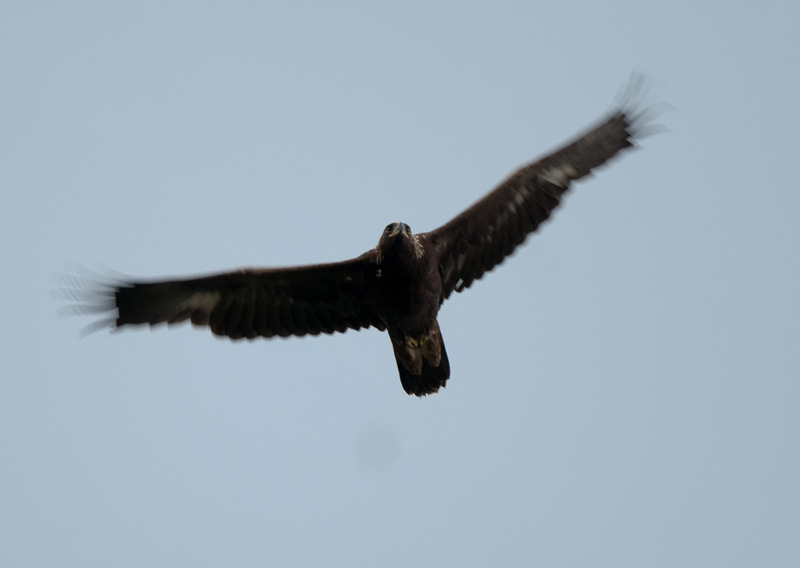 This juvenile was snapped in Spring migration along the southern shore of Lake Ontario. Again, white at the base of the flight feathers, the tailing wing edge is pale to translucent, and all the tail feathers are white along their basal half. 2009. Another Spring migrant, with white at the base of the flight feathers, and a juvenile tail type. Golden hackles. 2011. This bird was very close overhead. Showing the golden hackles. 2008. 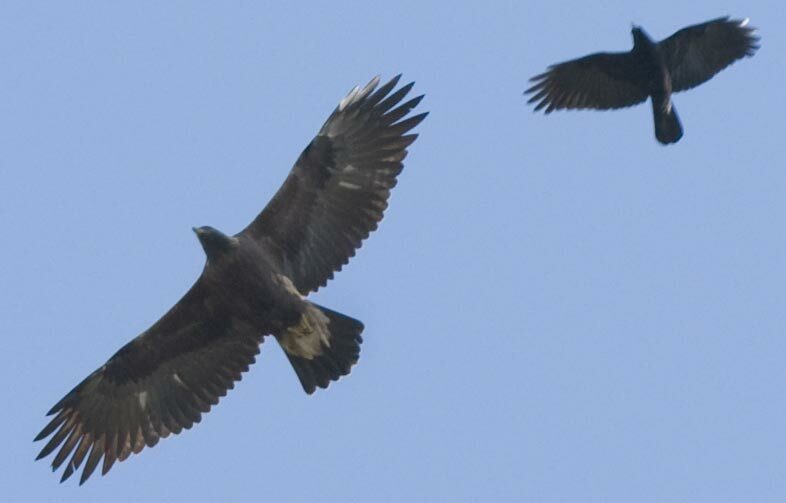 This juvenile with an harrassing crow in tow was photographed in the Fall of 2011. 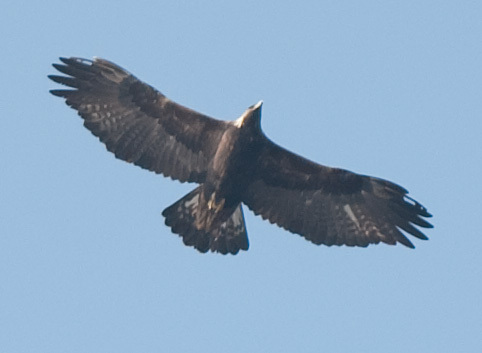 While it has a juvenile tail type, there is almost no white at the base of the flight feathers. This first plumage is unusual, but I see a few of these birds in both Spring and Fall every year. 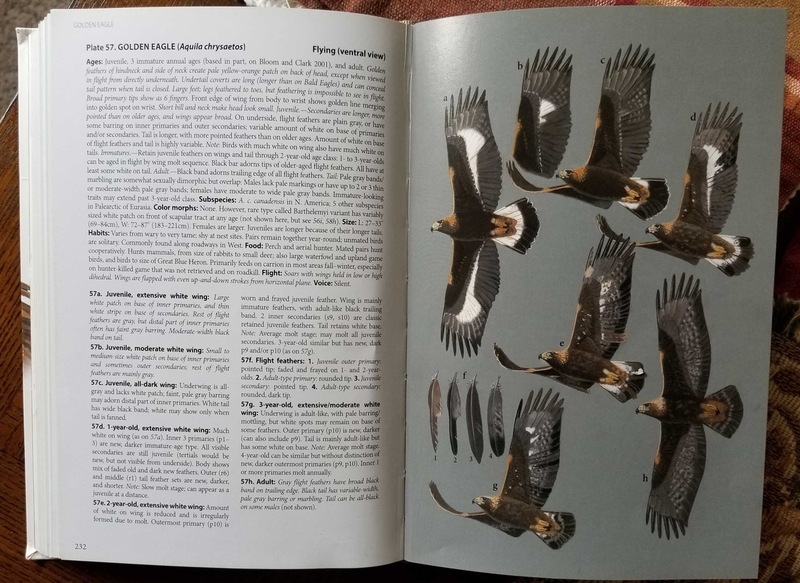 Unlike older field guides, this lack or variability of white in the flight feathers has been described in hawk identification guides since the early 90s. Here’s an adult bird photographed on St. Patrick’s Day 2018. 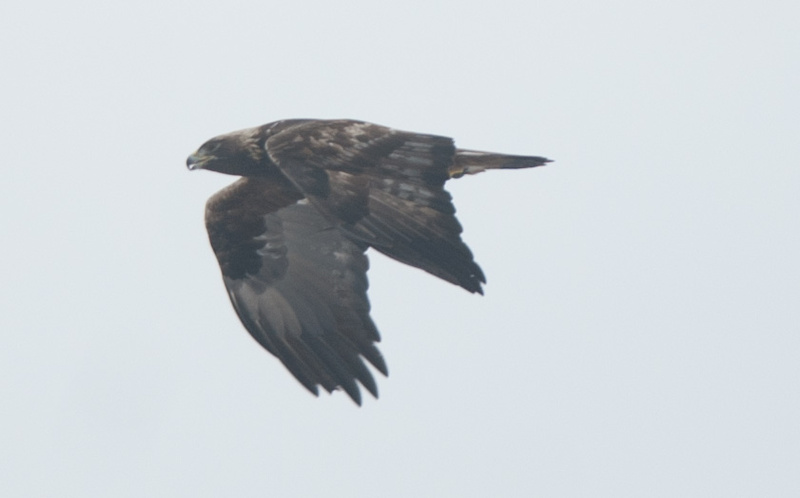 Adult Goldens, like our Buteo species, have a dark trailing edge to the flight feathers. The tail has lost its white base and now the tail feathers are barred. Golden hackles are easy to see. This is an adult Golden, although maybe only three years old or so. Golden hackles, barred flight feathers with dark banding. But the tail feathers, at least the outer one, still has a white base. This is from Spring 2013, so maybe with that Summer’s molt the outer feather pair darkened. 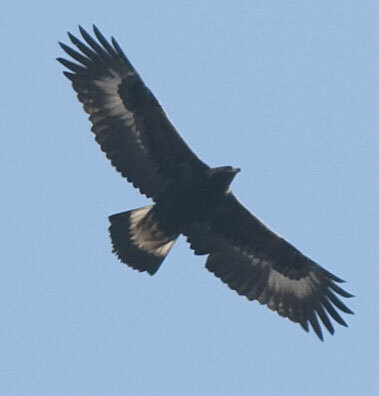 This young adult still has some tail feathers with white bases, although the central feathers are barred. The white-headed look, caused by the golden hackles, can confuse birders into calling this an adult Bald Eagle… at a distance. Also the second to outermost primaries are unmolted, showing a transparent center. This page spread is from Brian’s upcoming two-volume series in stores and online this June. 57G is like my image above from March 2010. Visible field molt is covered for all North American hawks, including the falcons (now classed as parrots). This entry was written by whyevolutionistrue and posted on August 7, 2018 at 7:30 am and filed under birds, photography. Bookmark the permalink. Follow any comments here with the RSS feed for this post. Both comments and trackbacks are currently closed. 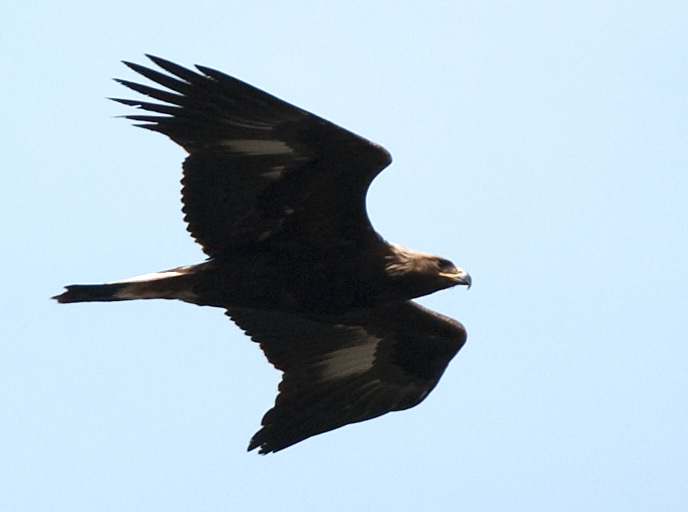 I saw my first golden eagle in the wild about three or four months ago, but it was not in flight. It was sitting on the side of the road, doing not much of anything. I didn’t think we had goldens around here, but I looked them up in my Birds of New Mexico, and it seems they are quite common. It didn’t seem spooked by my car as I drove on by, either. Falcons are now classed as parrots? That’s wild. I assume that’s based on DNA? Great photos and explanation. Thanks for sharing. Yes. And just months after the AOU checklist accepted the science, The Simpsons did a scene about the Falcon-Parrot change. Bart is always on top of things. I was surprised by the new classification as well. DNA is constantly reshaping our understanding of the natural world. 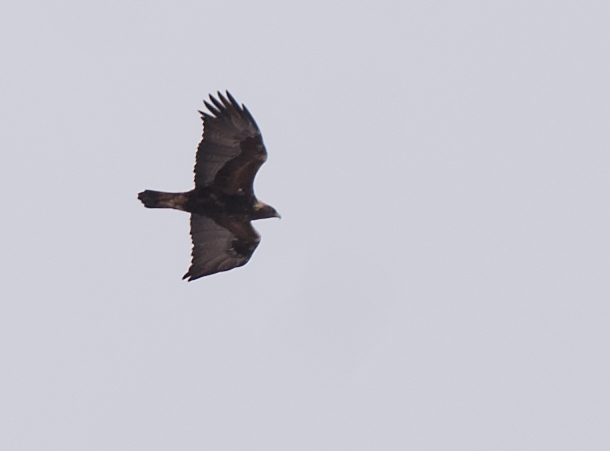 We always had a few Golden Eagles in Iowa but it was like 50 Bald Eagles for every Golden. Great birds. Fascinating RWP today, thanks for the write-up and photos. The only eagle I’ve seen around here is the bald eagle. I’d love to see a golden here in Washington, but they’re actually a candidate for the state’s endangered species list.